In the square called Campo di Santa Maria Formosa there is the ancient church pertaining to the Renaissance, built in 1400. On its bell tower many masks were stuck, or even carved, presenting frightening features that were supposed to expel and move away any sort of “evil eye”, the devil and bad luck. Over the door of the bell tower the “mascaron” stands out, the mask that exactly became the symbol of the inn (The Osteria) that is located in Calle Longa. In this area there are old palaces where before patricians and noble men used to live. Among these is also Admiral Venier, the winner of the glorious battle of Lepanto, during which the fleet of the Constantinople empire was destructed. 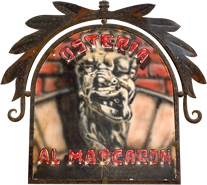 The venetians already used to go to the Osteria “Al Mascaron” at the beginning of the 20th Century, most of them being workers and outliers: it was known as a shop where local and southern wines were resold, and where one could find the simple dishes of the venetian traditional cooking.